6 compost stations have been located around campus. Students are encouraged to use them for all compostable material to contribute to our zero waste initiative. Compost any left over scraps as you come to or leave school or go to/from the gym and sports events. 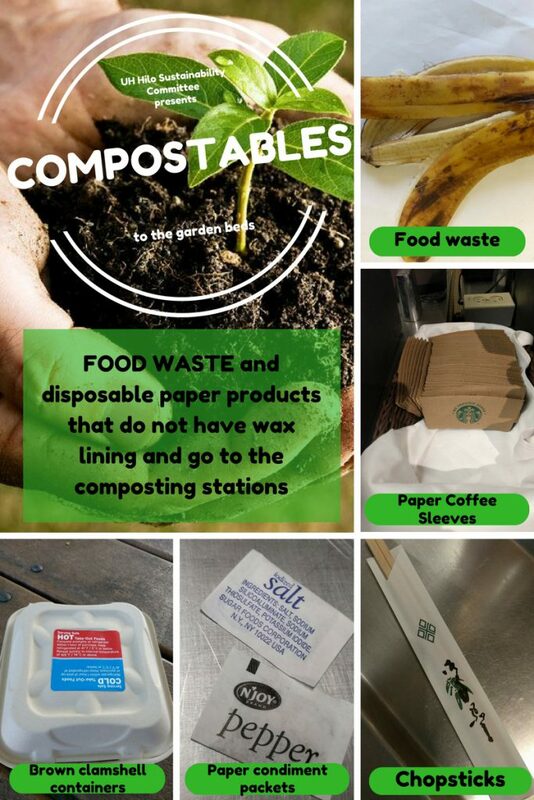 Compost any food/paper product scraps from Anuenue’s Kitchen (food truck), Thai Smile (food truck), Sky Garden Cafe, or other campus hosted events in plaza. Compost any food/paper product scraps from De Ja Brew and Campus Dining Center. 2 Large Official Waste Stations are currently in construction for the Campus Dining Center. Every compost effort helps Hawaii’s contribution to a healthier & happier planet. Please take the take the time to sort your trash appropriately. Many opportunities reside from composting our waste such as: Growing our own food for Student Driven Grow Markets, Medicinal Plant Research, Agriculture Development, Quality Soil Production and more! All composted material is currently utilized to promote more Raised Garden Beds around campus! One of our dreams is to be able to provide students access to healthy and quality plant resources directly from campus.